In the past, training company staff about health and safety in the workplace was seen as a costly and time-consuming endeavor. Employers and business owners were hesitant in providing this type of training as it also meant disrupting business operations and activities. It was simply seen as an expense without advantages. This is a misconception. There are several benefits to investing in health and safety training for both employees and employers. Employees have the most to benefit from taking courses in health and safety. All work environments have some element of risk. Factory workers can get into accidents while handling machinery. Mine workers can get injured while working in the field. Even office workers can land in the hospital if they eat food that has not been prepared properly. By taking NEBOSH courses and other similar training courses, staff are trained to become more aware of how they should conduct themselves while at the workplace and how to handle tools and equipment. This reduces the amount of accidents occurring in the workplace. Training also lowers the chances of staff getting sick. As a result, workers will take fewer sick days. Productivity rates improve as less man hours are lost due to sickness or injury. 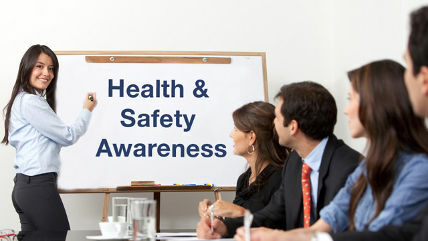 Undergoing health and safety training on a regular basis can create a culture of safety within the company. By encouraging employees to undergo health and safety training earlier on, they learn what they should or should not do while working. Conducting regular training and offering updates helps them learn the health and safety procedures until they become second nature. Companies should think of their employees as customers. By providing a safe working environment and treating them well, this increases the chances that they will stay in the company and build loyalty. Make them feel valued and they will return the favor by treating the business’ customers well. Your business will earn a reputation of providing quality service to its customers. By placing value on your employees’ welfare, you create a ripple effect that could extend beyond the walls of your office or the company. Laws can vary depending on where the company or business is based in. In the UK, there is the Health and Safety at Work etc Act of 1974 and the Management of Health and Safety at Work Regulations 1999. Most other nations will follow a similar law or regulation. With most laws or regulations, the employer is required to provide all hired employees the necessary information, training, instruction or supervision needed to keep them safe and healthy while inside the office or work environment. Injuries can happen even with office workers. Even a single lawsuit can make a business go bankrupt. You could spend a fortune with paying lawyers, fines or compensating workers. By complying with local laws, you are also protecting your company or business against any potential lawsuits. Litigation is not the only aspect that costs money. Other than paying for various fees and fines, the company may also be required to pay for the injured employee’s medical expenses. This includes the hospital stay, doctor’s fees, medication, rehab and more. Any accident or injury could also result in an increase in insurance premiums. Plus there is also the cost in productivity. If an explosion occurred inside the factory, the employer will have to pay for clean-up and repair of the machines and the area itself. The company may need to recruit, hire and train additional workers to replace the injured ones. This can take time and will cost the company money and effort as well. Investing in health and safety programs may cost money upfront but it can help the business save money in the long run. There are dangers and risks to working in any type of environment. The same is true whether it is a desk job, working in a factory or on the field. By encouraging all employees to undergo health and safety training, productivity rates are improved, sickness and injuries are reduced while avoiding costly legal battles. Dave Newgass is the owner and Managing Director of Wise Global Training Ltd. Born and raised in a small California coastal fishing town but now living in the United Kingdom, Dave’s goal is to ensure that clients are not only happy with the IOSH and NEBOSH online courses they purchase from Wise Global Training Ltd., but are also happy with the total experience as a whole.